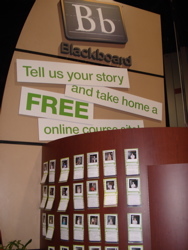 Blackboard’s booth at NECC in Atlanta was one of the best examples I’ve seen recently of Socratic Marketing. They asked teachers to write a brief paragraph on how they intended to use a free trial of the product in their classrooms. 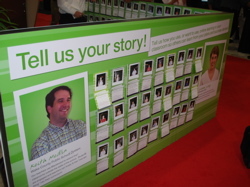 Then they took a polaroid of them and pasted several hundred of them all over the booth. In an inversion of current trends they created a real version of a virtual community. It was fun and interesting to browse the cards and it made a strong visual statement. It was arresting in its simplicity and represented a validation of the products in the words of end users. It also showed that great marketing doesn’t have to cost a lot.